The app market is bigger than it's ever been and, while it seems there's a lean towards free apps as opposed to paid-for products, there's still plenty of money to be made in the market. 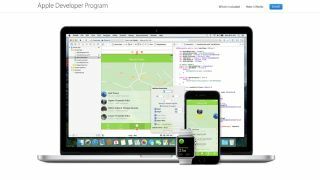 We'll come into this article assuming you have a little pre-existing knowledge of coding and can work your way around a portable language like Xcode or Unity – it's a little outside our scope to teach you how to program the things. Instead, we're looking at ways you can exploit your skills, get yourself in the right places, and bring in some cash from the potentially lucrative handheld software market. To publish software on the Apple App Store or Google Play Store, you'll need to be a fully registered member. Apple's scheme, the Developer Program, is not free, presumably to stop potentially awful apps from having to be scrutinised by its team of testers. It'll cost you a yearly fee of $99 (around £80, AU$135) to sign up here, although this also entitles you to a bunch of testing tools, early access to versions of Apple's dev apps, and the ability to publish for Mac, mobile devices, Apple Watch, Apple TV and more. Google Play's development program is less costly, with just a $25 (around £20, AU$35) sign-on fee which entitles you to use all of the search giant's online dev tools and accept payments using the Google Payments system. Both, once you're registered, will give you access to their respective in-app payment engines, allowing you to accept money for upgrades from your customers. What you develop is highly important. If you're a one-man army, it's unlikely you're going to be developing the next big mobile game. So pick a niche instead; an area where someone might need an app so much that they're willing to pay for it. Search the app stores for competing apps and see what they're able to charge. Let's take a glance at Nintendo's recent hit, Super Mario Run. It's downloadable for free, and you get three levels to play as much as you'd like. But the full thing costs a cool $9.99/£7.99 – a fact that many users weren't aware of until they beat those first three levels. Had Nintendo put that price on the app itself, there's a good chance it would have fallen flat on its face – many mobile users are completely unwilling to part with cash until they know that what they're buying is quality software. Instead, Nintendo released a free app with, essentially, a paywall. Since users were already hooked, they were more than willing to stump up the money. That 'free' tag, even if you include in-app purchases, has a huge amount of power. Get the users in before you ask for their money, and give them the best experience you can without them having to pay. If you're holding back features, make them non-essential but nice to have, so that your most dedicated users cough up. If you have an app on a store, you're going to get feedback from users. Often, this will be unnecessarily harsh feedback. But don't be disheartened, as this is the natural course of any online feedback mechanism. Read them, and respond to those who have had problems running your app. Fix problems as you see them. Fight fires as they pop up – it's not going to be fun. The reason you need to be responsive should be reasonably obvious – users browsing app stores will pick up the apps they see with the highest rating. You need to do everything you can to get as close to five stars as possible, and that means treating your users well and fixing people's issues. It's not just feedback that affects your download numbers, of course – you can be as responsive as you like, but if you don't have those star ratings, you're not getting anywhere. So include an option in your app to help increase your visibility and move you through the algorithms of these app stores. There's value in the latter option, certainly – while the former couple may get you a higher volume of ratings, squirrelling the option away restricts your star rating to the dedicated. Don't want to ask your users for money? Want to make a little extra money on the side? Depending on the type of app you're using, you have a few potential options for hosting ads.